Good morning from partly cloudy, cold and windy Northeast Ohio! This is the forum where we can show work in progress, completed projects or new or old photographs of out layouts. Let the show begin. Still have not got my painting area set up, but am still working on building new cars etc. Finished the Exactrail 4427 CF Covered Hopper kit, all installed except the roofwalk, which will be added after the car is painted and decaled. Completed an Intermountain FMC 5283 CF Boxcar that will be painted for the SP. 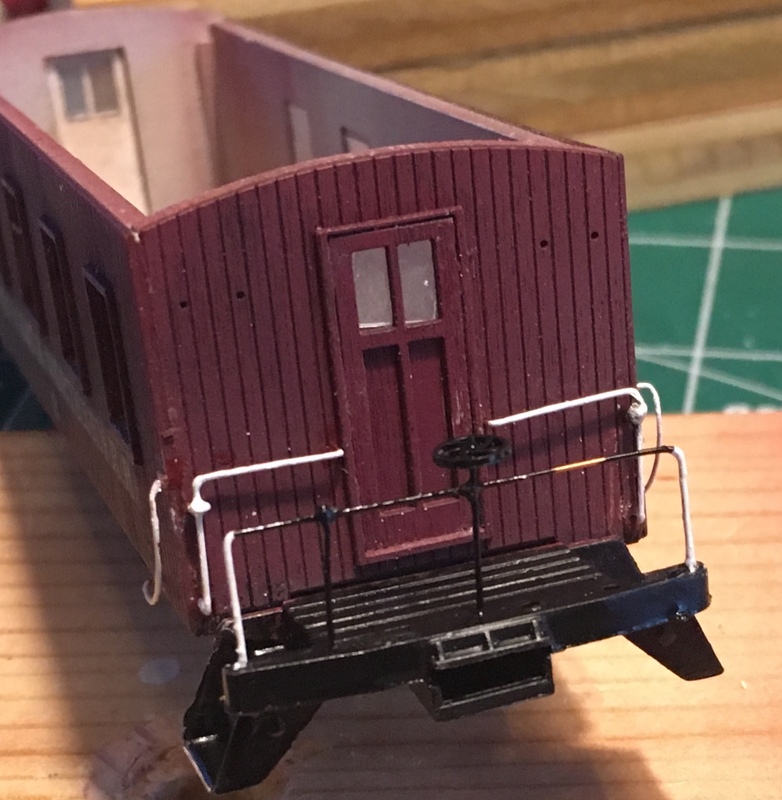 Started work on a Rock Island Combo Door Boxcar, used an Intermountain Kit, added Moloco Draft Gear for the end of car cushioning, still in progress. Another picture of my Rapido PRR FA-2's with a traiin composed of mainly short covered hoppers hauling sand/cement. Thanks for kicking off this edition of WPF, Rick! You must have a great deal of patience to get those corner ladder/grabs mounted into that little piece of angle iron, Rick! I hope you get your paint booth set up soon. Excellent modeling! 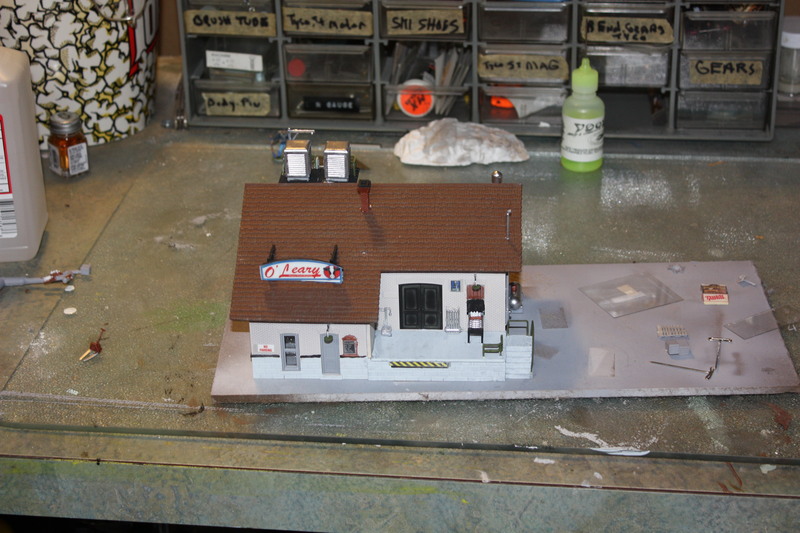 I didn't get much done scenery-wise on the "little crossing" scene but I did manage to get two more jobs out of the paint shop. This PRR R60b has been waiting for decals and I finally found an old set of Champ ones that had the word "Refrigerator" in it. The color is a bit dull for my taste but in reality, these cars were usually pretty filthy so you couldn't see much of the lettering anyway. I just can't seem to get enough cabooses to satisfy my fix! I need to make a pair of flags for the marker brackets. On to more great contributions! From: NS(ex PRR) Mon Line. Rick, those hand grabs would drive me insane. Ed, those cars look great. Who made that caboose? 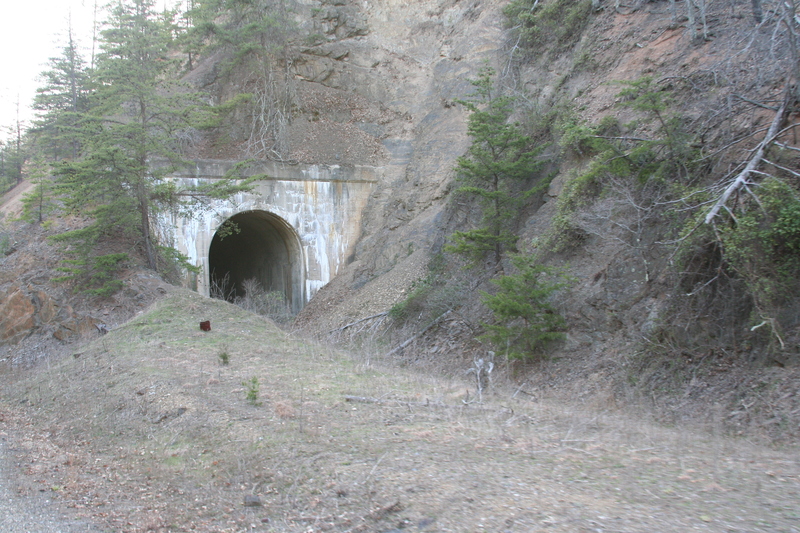 yes, it's an anbandoned and collapsed tunnel. The slide in the portal mouth Will be covered by Talus. 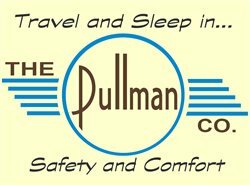 These are the opinions of a 26 year old, from the east end of, and modeling, the same section of the Wheeling and Lake Erie railway. 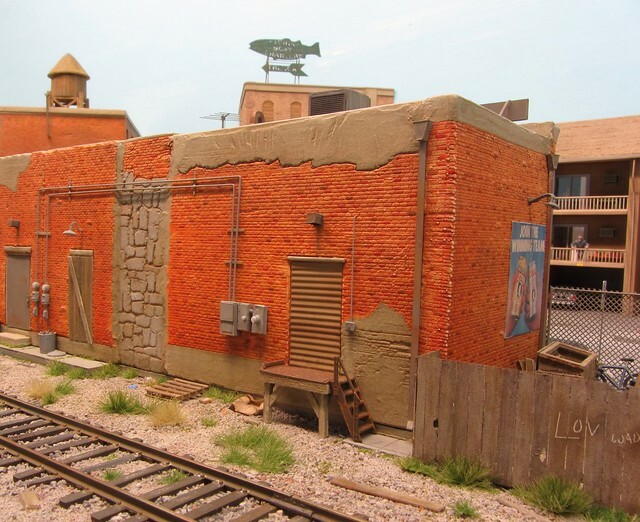 As well as a freelanced road (Austinville and Dynamite City railroad). The caboose is an Oriental brass model. It wouldn't be too tough to scratchbuild one out of currently available plastic models, I'll bet. 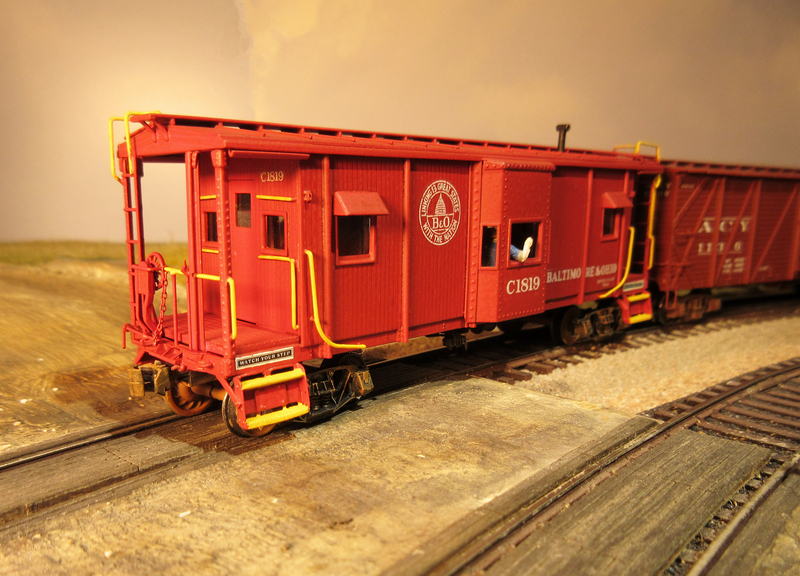 Forum member Tom Stage made a New York Central war-emergency caboose. Maybe he will pop in here with a photo? Rick ... Thanks for starting phto Fun..... Your work on the frieght cars is great, and I like the PRR Alcos. Ed ..... 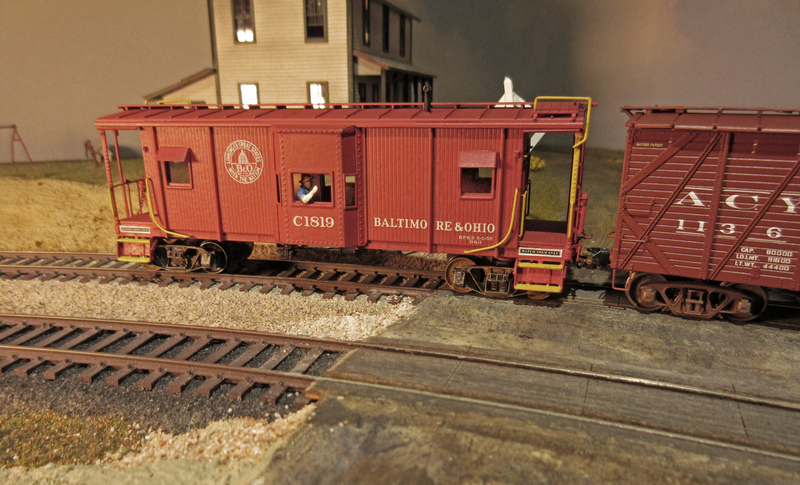 Very nice express reefer and B&O caboose. Jimmy .... I like your idea, and you are doing good work with it. Below is a recent photo of Reggie's Junk Yard. Rick: Thank you for starting us off this weekend. I love assembling these kits. 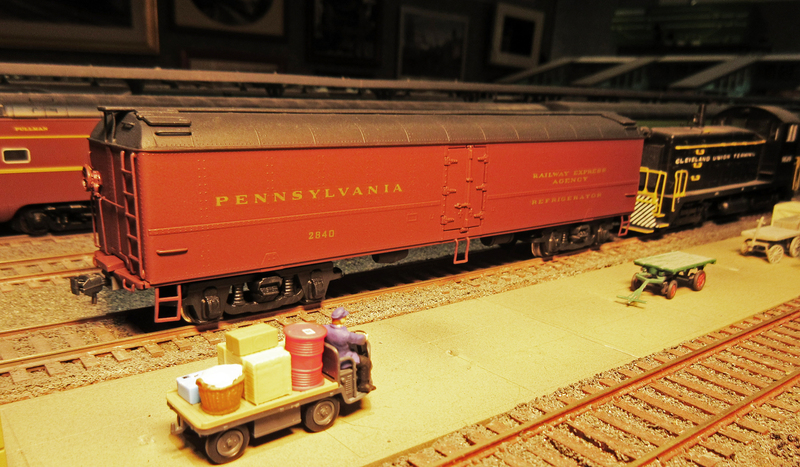 I have five Intermountaion 1397 boxcars I am building assembly line style right now. Ed: That is a neat caboose. Rebuilt stock car? I hope they got the smell out! Jimmy: The collpsed tunnel is a good idea. Garry: Reggie looks like he could use more junk! That is a great scene. I present for your pleasure, the photographic debut of WOLF RIVER & WESTERN #19410. 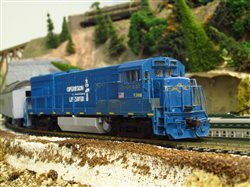 This is a NYC boxcar from BLI that I painted Brunswick Green. This is my newest addition to the circa 1954 fleet of nonsense. Keep it rolling! My finger is feeling better, so I might type more this weekend. Brunswick Green on a NYC box car? I'm surprised you got it to stick! Thanks for all the comments on the grab irons, but after doing 10 of those cars it is now pretty simple, I did 4 of them the first time and it was a bit tedious as I did the same operation on each car then moved to the next step. These grabs were pretty simple, the angle iron is in two different planes so the legs on the grabs were designed at two different lengths so they only fit correctly in one direction. 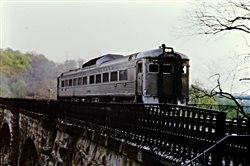 Now on the Tichy Coal cars its a different story, the angle iron is a lot flimsier than that on the Exactrail cars, also the grabs have full length ends that have to be cut down to about 1/8" before mounting, a much more difficult process. I have done about 8 of these cars, and have about 10 more to do, which I may get to some day. Kevin, doesn't look dark enough to me for DGLE!! Thats it, I have to change browsers so I can see Ricks picture. It sounds to interesting. 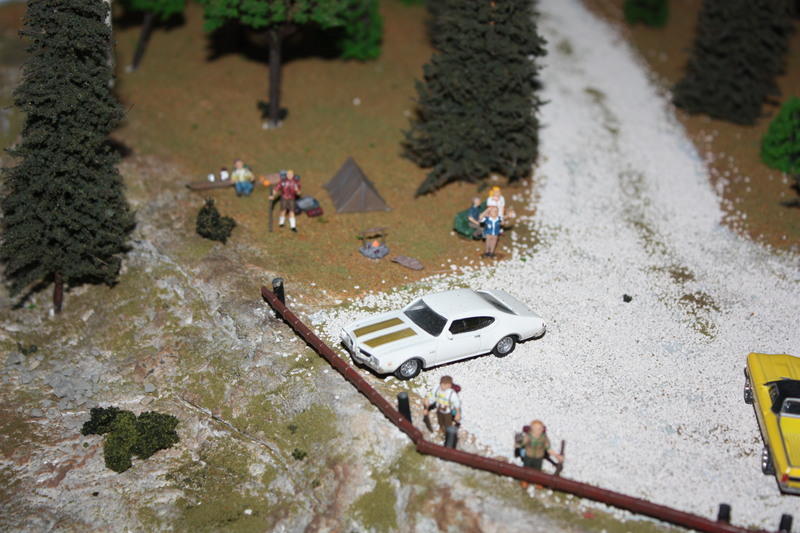 Here is a scene taken at our local club. Have a great weekend. 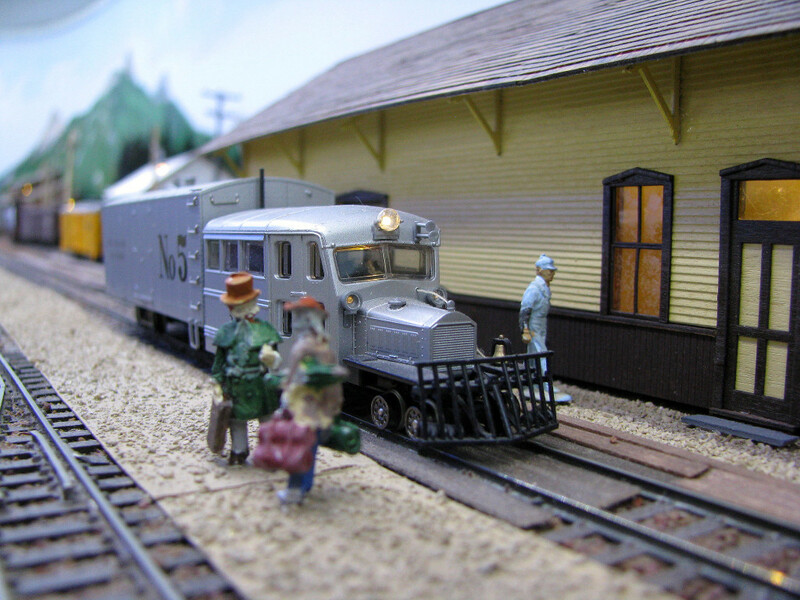 Rick: I have only completed one Tichy two bay hopper car. I have done many Funaro & Camerlengo and Westerfield Hoppers. Those corner posts on the Tichy cars are A+ Beautiful, but they also give me fits. It stuck pretty well, but the freight car has been nothing but grumpy since it was painted. I take my equipment portraits with the camera in full auto mode, and a lot of image correcting takes place in the camera. There is a color shift when I photograph dark colored freight cars. I used Scalecoat 2 Brunswick Green for the paint. 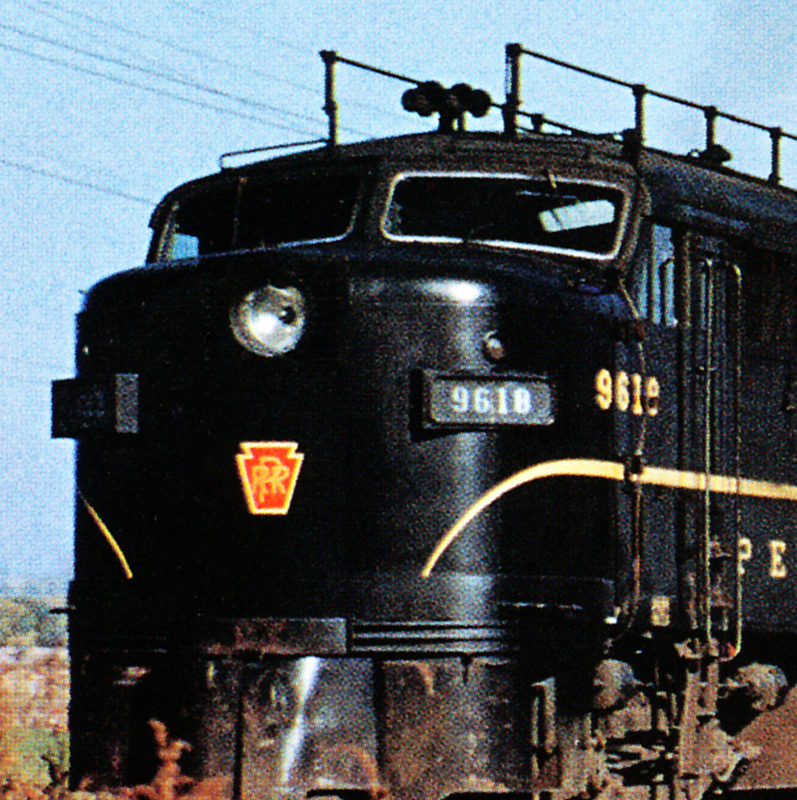 I have seen darker versions of the PRR color. I logged back in using Chrome, so I can see your pictures. Excellent! Now I see the parts you pointed out in another thread. Nothing new from me this week. Those are nice engines, but did those windshields really look like that? Under normal viewing the turbine looks just like the I1s in the background, but the camera does this. I don't know if BLI uses different paint since the boiler of the S1 is brass and the I1s are plastic. Back in the film days certain types had troubles with different colors. I would assume (and you know what that means) that they are correct. 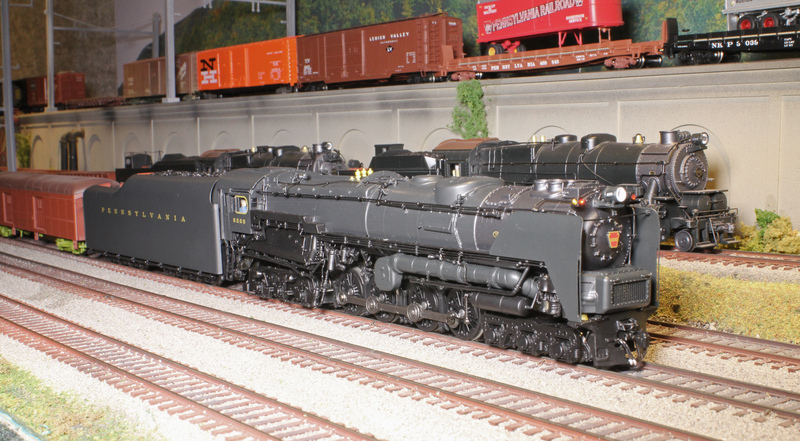 The PRR Historical and Technical Society aided Rapido in the making of thsese models. My Life-Like C-Liners also have the chrome strips around the windshields. Sometimes the PRR surprised you with spending money on things that were not necessary for the operation of the locomotive. It wasn't very common, perhaps these were replacement parts that didn't get painted. Out of dozens of photos I looked at I found only two FAs with the aluminum windshield frames. Several Baldwin Sharknoses had them, too. As always, good looking stuff here in WPF. Keep em coming kids ...... Enjoyed. Rick, Thanks for opening the WPF and the nice bench shots of your precision modeling, also like those charming FAs. I've been busy the last couple of weeks. Finishing up a 10 spine car fleet, trailers for spines to haul, and collecting and stripping paint for my upcoming passenegr train set. On the spines, I replaced the plastic grating with Plano etched metal, the cars started out in a bright red fantasy scheme for the ATSF, had to strip and repaint, and add decals. Working with Chrome browser, works great with PB and this site. Moving pictures from PB is a little different than before, but works great. I've notice some post using IMURG. or whatever it's called, don't show up, just a black box saying it's no longer availiable? OK, sorry, back on topic! Ed and Rick, thanks for clearing that up; I should have known better than to question Rapido's authenticity. Great work all. I took some pics of my current projects. First pic is my campers my wife got me for xmas. 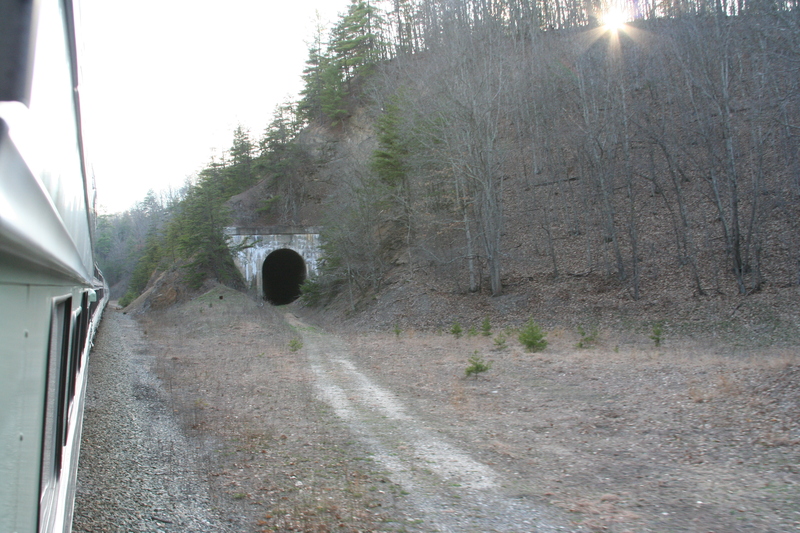 Below them is a train tunnel. 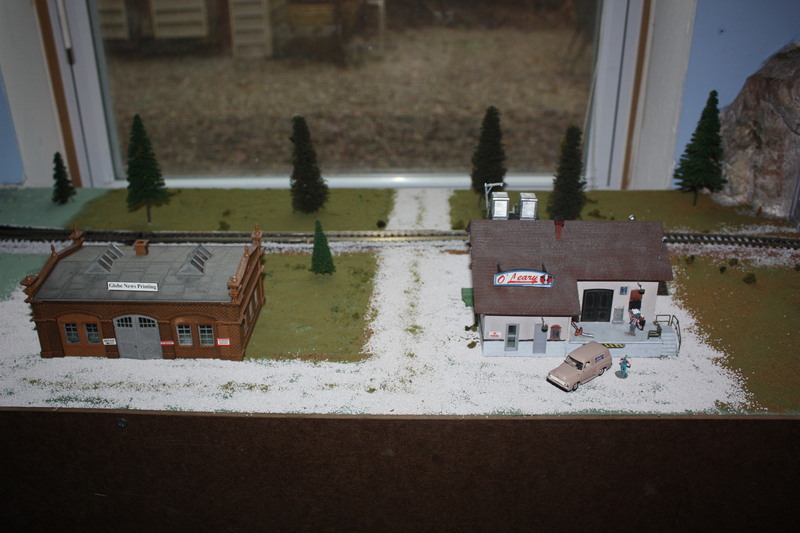 And the Dairy on the layout. Great stuff again this week guys. I particularly liked the variations of the cabeese. Thanks to all for your contributions. 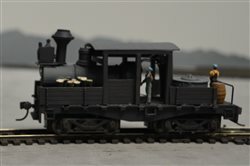 Nothing new on the BRVRR this week, but here is one from the website: Black River Valley #1116 is the only 'home road' locomotive on the layout. Keep the photos and ideas coming everyone. Thanks to you WPF is always the best thread of the week. Looks pretty good, Henry. And so does the rest of WPF. Just dropping by with nothing really new this week, although I've been doing some organizing of old pics. Here's a tasty shot of Goose #5 at the Silverton platform. Gidday All, once again it’s great to see everyone’s really Good Stuff, and while it’s unfair to single out individual contributions, but as another early start and therefore long day beckons, that is what I’ll do. 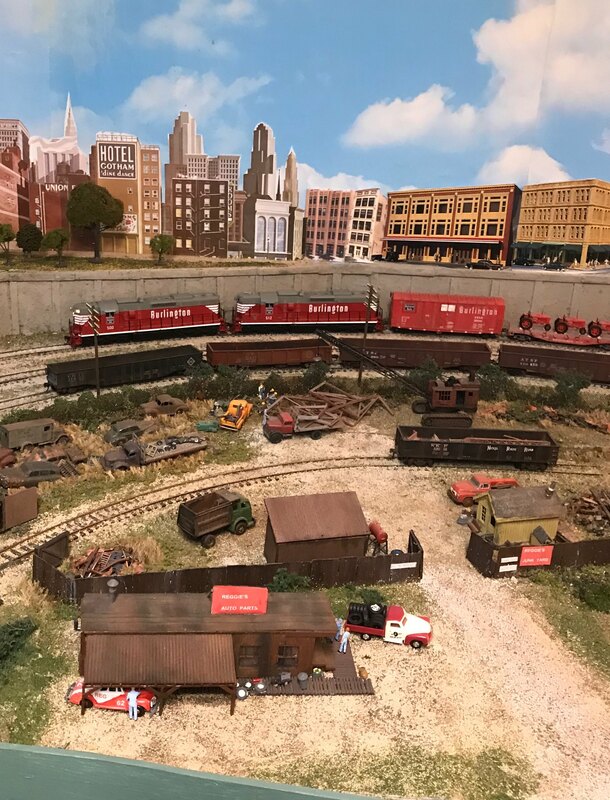 Jimmy, the urge to fill a layout with as much track, or industries to justify that track, runs deep with most (all) the modellers I personally know, so a big thumbs up to your abandoned tunnel. Henry, you can completely ignore that comment I made previously that with the helicopter 3 foot view you could virtually get away any old rubbish, because those railings look great, close up. "One difference between pessimists and optimists is that while pessimists are more often right, optimists have far more fun."